I love eggplant parm. I was peeling an eggplant to make it when I realized, that I really should have another one, but it’s cold and I didn’t want to go out to get another eggplant, so then The Goddess improvises. In the way my mind works, or doesn’t, I thought SOUP! Anyway, you may have heard that lately soup has been on my mind, so in the words of the late Mr. Spock, “It is perfectly logical”. I thought eggplant parmesan in soup-form might work. I think it did. This really is a throw-it-all-together, let it cook for a bit and then serve-it-up type of recipe. It doesn’t take long at all and it will give you time to do some other mindless task, if you so desire. The list of ingredients might look daunting until you read them, but it’s pretty much on-hand sort of things. I think this would be great served with a grilled cheese made with some good mozz and sharp provolone, and grilled with garlic butter. Can’t you just taste it? Heat a soup pot over medium heat. Add the oil and when hot, toss in the eggplant, onion, bell pepper and both garlics. Cook, stirring frequently until the eggplant is softened, about 6-8 minutes. It isn’t necessary for the veggies to brown. Stir in the pasta sauce, balsamic and tomato juice to attain the desired consistency. 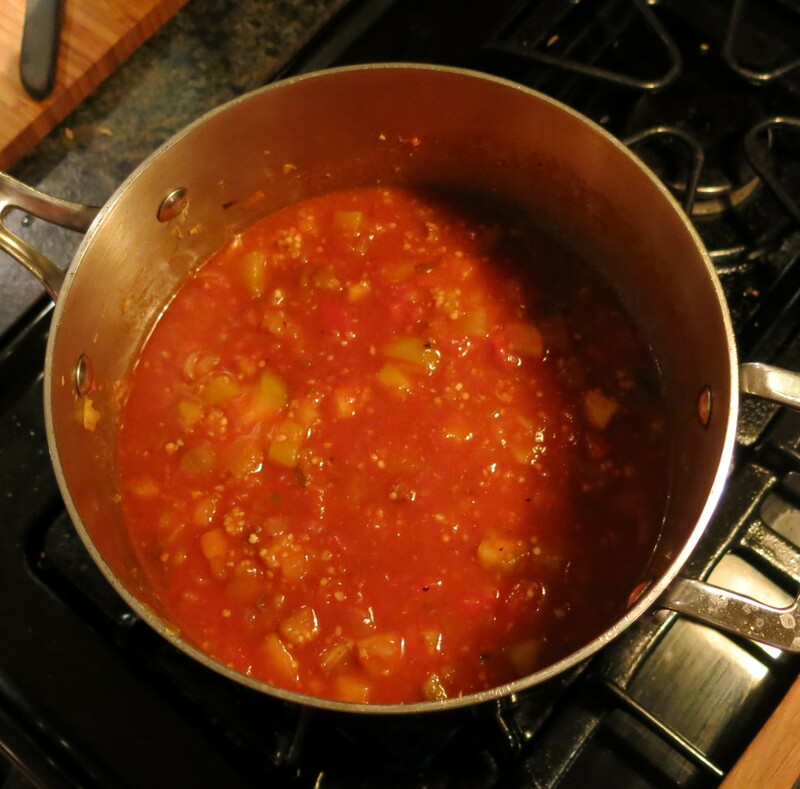 Stir the parmesan rinds into the soup, submerging them into the tomato mixture. Return to a simmer; stir occasionally and cook for 10-15 minutes. Stir in the herbs and sugar; taste and add salt and pepper as needed. Continue to simmer for 8-10 minutes longer. Remove the parmesan rinds and discard (I dice them very finely and return them to the soup pot). Serve with croûtes that have been topped with pesto or garlic and cheese. Pass freshly grated parmesan cheese on the side. NOTE: Exact measurement is not terribly important here. Use what you like; add a hot chile, some diced celery, pesto, etc. I think this would be good with panko that has been sautéed in olive oil with garlic, combined with parmesan cheese and parsley; sprinkle over the top of each bowl and serve. You may use 1 28-ounce can of crushed tomatoes instead of the pasta sauce. 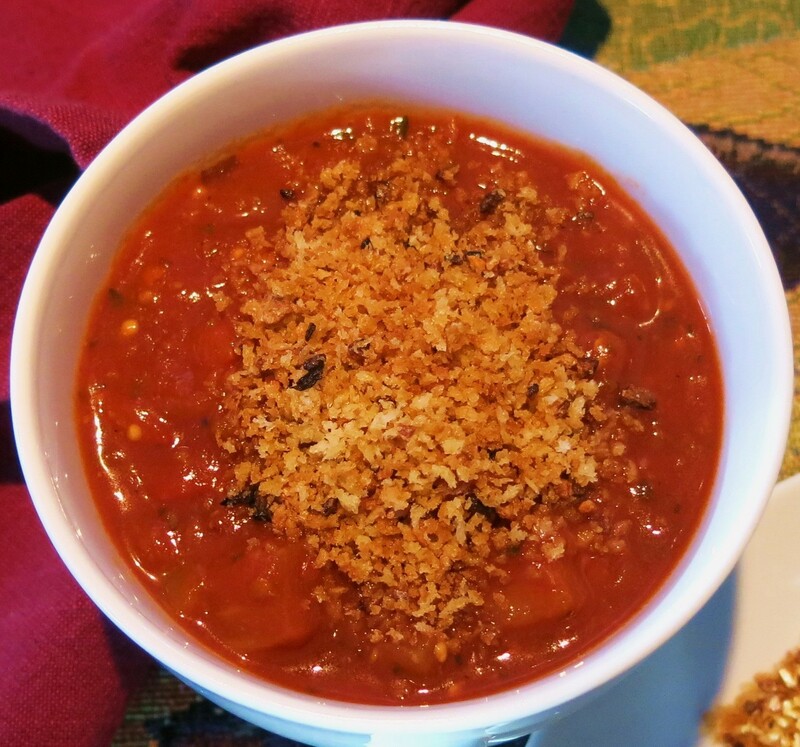 Eggplant Parmesan Soup Recipe©Marcia Lahens 2015. All rights reserved. I used closer to 2 teaspoons of the minced dried garlic. I prefer to use dried minced garlic, as it retains its shape better and I like biting into the little bits. Was this ever simple and it has far fewer calories, but all the flavor of eggplant parmesan. The soup, as is, is gluten-free, for those of you that have that issue. 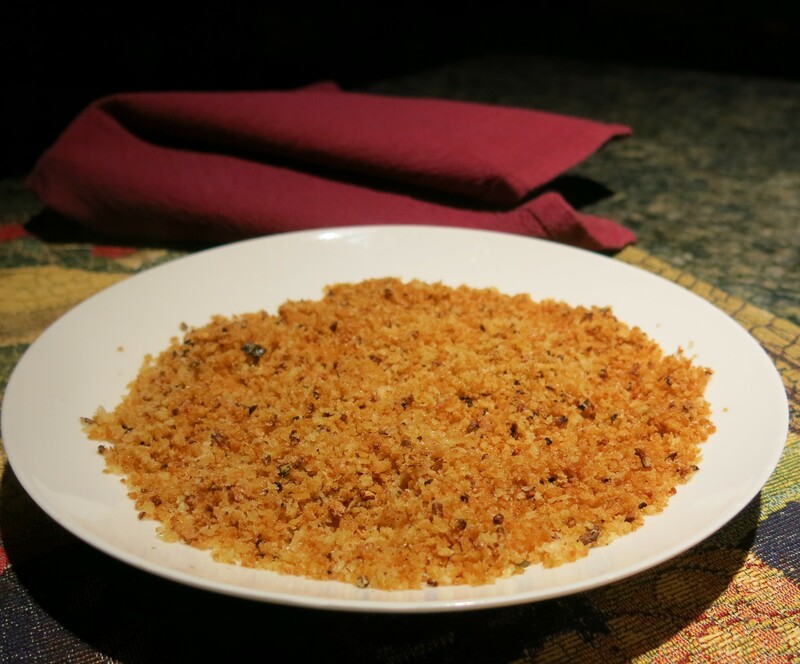 Obviously, the bread crumbs change all that, unless you use gluten-free bread crumbs, but you could just opt for shredded cheese. This goes together very quickly; I think it took me longer to prepare the eggplant than it took to make the soup…I’m a slow peeler. Would you go red bell pepper – as opposed to green? I think if you want to add bell pepper, the red bell would be much prettier and it will be slightly sweeter as well, but if you have green bell, then green it is. I love having a bag of frozen bell pepper strips (the mixed variety) in the freezer. The freezer does half the “cooking” and they’re always readily available. If you want them chopped, they chop quite easily frozen…I know, I know…way more info than you asked for!